(At President Woodruff’s request, President George Q. Cannon read the 1st Section of the Book of Doctrine and Covenants). I want the attention and the prayers of the Saints who have assembled upon this occasion. I have been sick and very weak in my body for a month past, and did not feel that I would be able to attend this Conference till the day before it opened. I have been blessed in this respect to be with you. I desire to say some things to you, and perhaps some strange things, too. I feel disposed to say something about myself, to give you a little of the history of my life, because of what I may want to say, [p.29]before I get through, to the rising generation of Israel. My remarks may be very eccentric to any but Latter-day Saints, and to them also, I expect. I suppose when I was born the devil knew what I should be called to do; for there has been from the day I was born until the present two powers with me—one to kill me, the other to save me. I stand before you today a pretty sound-looking, for a man ninety-one years of age. I stand before you with a body in which almost every bone has been broken except my back and neck. I have had through my life a power after me to take my life. When I was about three years old I was pushed into a caldron of boiling water, which had just been taken off the fire. My grandmother took me out, and my skin all dropped off excepting off my head and feet. I was wrapped up for months in cotton and oil. That was the beginning of my troubles. When I was twelve years of age I was drowned; at any rate, I lay in thirty feet of water long enough to drown anyone. After several unsuccessful attempts, I was brought up out of the water. This was under the Farmington mill dam. I was just as dead as I shall be thirty years hence. I lay on my back and saw the sun go out, and passed through all the sensations of death that any man would in drowning. After an hour’s labor, I was brought around to life again. I shall not go into the particulars of many of these things, but I have passed through what may be termed death a number of times in my life. When I was 15 years old I was in one of those Connecticut blizzards. I walked four miles through a wood into the open country, and I sought some place where I could hide from the storm and rest. There was but one house within a mile of me—that was the poor house, which was about twenty-five rods away. The man was moved upon to go up in his garret to get some pennyroyal to give to a sick woman, and he felt led to look out of the window. He saw me crawling into the hollow of a big tree. He knew what the result of that would be better than I did. He took his horse and sleigh and came to me, and when he got there I was asleep, and he preserved my life. When I was 14 years old I was bit by a mad dog, and ought to have died; but I did not. So I continued on, until I can say that I have broken both of my legs, one twice; broken both of my arms, breast bone, several ribs, and altogether been through a pretty hard experience for a man who had to be called to preach the Gospel, at least. I was a miller by trade. I have been in two water wheels under full head of water, and I suppose I ought to have been killed in either of them, but I was not hurt. That preserving power has followed me all the way through my life. It has been with me upon my missions abroad as well as at home. It has followed me until the present day, and I have been placed in a great many strange places. I was ordained to dedicate this Salt Lake Temple fifty years before it was dedicated. I knew I should live to dedicate that Temple. I did live to do it. I had a great desire in my boyhood to receive the Gospel of Christ, to see a prophet or somebody that could teach me the Gospel of Christ as taught by the ancient Apostles and as I read of in the New Testament. I desired this with every sentiment of my heart, and on the first Gospel sermon I ever heard I was baptized, with my oldest brother. I immediately went to Kirtland. I was in Zion’s Camp with the Prophet of God. I saw the dealings of God with him. I saw the power of God with him. I saw that he was a Prophet. What was manifest to him by the power of God upon that mission was of great value to me and to all who received his instructions. I will refer to one instance. A short time before we landed in Missouri Joseph called the camp together. He there prophesied unto us, and told us what lay before us. He gave us the reason why chastisement was before us. He says: “You consider me a boy with the rest of you. You have not realized my position before the Lord. But there is a chastisement before this camp.” He told us that this would come upon us because he had not been obeyed in his counsels. In one hour after we landed in Missouri and pitched our tents at Mr. Burkett’s, one man began to fail here, [p.30]another there, and in a few moments we had a dozen of our camp stretched upon blankets with the cholera. The Prophet of God, when he saw this, felt to sympathize with them, and he and Hyrum laid their hands upon Brother Carter, the first man that was taken sick, but as soon as they did it they were seized themselves, and they both had to leave the camp. He said afterwards: “I told you what was coming to pass, and when affliction came I stretched out my hand to stay it, and I came very near falling by it myself.” That mission was very interesting to me. I want to say here that in all my life since joining this Church and kingdom, notwithstanding these powers that have been with me to kill me, I have always had the revelations of God with me. That is something I want to talk about to Israel before I get through. The power of God has told me what to do and what not to do. While the devil has had power to afflict my body very seriously, there has been a power with me that has saved me through it all. And, whenever I have had the Holy Spirit with me to tell me what to do, I have had to do that. By that I have been saved. By listening to that still small voice I am here today with you. There are two reasons why I am here today. 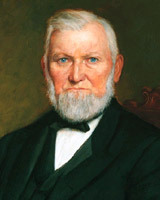 When I went back after the pioneer journey, President Young said he wanted me to take my family and go to Boston, and stay there till I could gather all the Saints of God in New England and Canada and bring them to Zion. That was the mission he gave me on my return from the pioneer journey to Winter Quarters. I went in the spring, as he told me, and took my family. We came one evening to one of the brethren’s houses in Indiana. Several of us were there. Orson Hyde had a team as well as myself. We drove into a long yard. I set my carriage within six inches of his. I had my wife and children with me. I tied my animals to an oak tree on the other side of where we camped. I went to bed in my carriage. As I laid down, the Spirit of the Lord told me to get up and move my carriage. I did not ask the Lord what He meant. I did as I was told. The same Spirit told me to go and move my animals away from that tree. I did that. My wife asked me why I did it. I told her I did not know. I had not been in bed twenty minutes when there came a whirlwind and took that oak tree, which had stood there perhaps fifty years, split it right through the trunk, and it swept through both of those fences where my carriage had stood. It never touched Brother Hyde’s carriage, but it would have crushed me and my family to the earth if I had not listened to the voice of the Spirit. After spending two years and a half in New England and Canada, getting the Saints out, I started back with the last lot, about a hundred, from Boston. We landed in Pittsburgh at dusk. We were anxious not to stay there, but to go on to St. Louis. I saw a steamer making steam ready to go out. I went to the captain and asked him how many passengers he had. “Three hundred and fifty.” “Could you take another hundred?” “Yes.” I was just about to tell him we wanted to go aboard when that Spirit said to me, “Don’t go aboard that steamer, you nor your company.” All right, said I. I had learned something about that still, small voice. I did not go aboard that steamer, but waited till the next morning. In thirty minutes after that steamer left, it took fire. It had ropes instead of wheel chains, and they could not go ashore. It was a dark night, and not a soul was saved. If I had not obeyed the influence of that monitor within me, I would have been there myself, with the rest of the company. The Thirteenth ward would not have had an Atwood for a Bishop; the Church would not have had a Leonard W. Hardy as Bishop. They were both with me, and their families, including Brother Samuel Hardy, who is in St. George now, upwards of ninety years old. I never disobeyed that Spirit but once in my life; I did it then through the urgency of other persons, and it nearly cost me my life. I have been acquainted with this Spirit. It was not the blow of trumpets nor thunder and lightning; it was the still small voice to me. All the way from my boyhood I have been governed and controlled by that Spirit. My missions [p.31]have been by that Spirit of revelation. I was told to go to Fox Islands by that same still small voice. In the time of the great apostasy in Kirtland the Spirit of the Lord said to me, “Get you a partner and go to Fox Islands.” I knew no more what was in Fox Islands than what was in Kolob. I went there, however, baptized a hundred and brought them up to Zion with me. It was upon that Island where I received a letter from Joseph Smith, telling me that I was called by revelation to fill the place of one of the Twelve who had fallen. You will see it in the Doctrine and Covenants. That thing was revealed to me before I received the letter from Joseph Smith, but I did not feel disposed to tell it to any mortal man, for I knew it was my duty to keep such things to myself. Through all my life and labors, whenever I have been told to do anything by the Spirit of the Lord, I have always found it good to do it. I have been preserved by that power. That power was with me when I went to Herefordshire. I was preaching every night with Brother Cordon, and one night we held a meeting in the town hall at Hanley, in Staffordshire. The Spirit—that still small voice—said to me, “This is the last meeting you will hold with this people for many days.” I told the Congregation so when I got up. They were very much astonished, and asked me where I was going. I told them I did not know. After, I went to ask the Lord what he wanted of me, and He told me to go to the south. That was all the answer I got. I took the stage and rode eighty miles south. The first man’s house I went into was John Benbow’s. I had not been in his house fifteen minutes till I understood why the Lord had sent me there. There was a people broken off from the Wesleyan Methodists, who had banded together and called themselves United Brethren. They were watching for the coming of the Son of Man, watching for the Gospel of Christ, as they read of it in the New Testament. The first thirty days after I got there I brought into the Church some two thousand, with fifty ministers, and all their chapels, licensed according to law, were in my hands. There was no blowing of trumpets about that. The Spirit of the Lord told me to go there, and when I got there I saw why I was sent. That is, perhaps, enough to say about those things. Now, I want to say to this congregation, to the young men of Israel, to the Elders of Israel, to all our missionaries, the day has come when the God of heaven requires at my hands, as the President of the Church of Jesus Christ of Latter-day Saints, to say unto you, it is the will of God for you to take this course. Get the Spirit of God before you go on your missions or anywhere else. Get the spirit of revelation with you. And when you get that you are safe, and you will do exactly what the Lord wants you to do. I have felt strongly impressed to say that to this Conference. What can you do without revelation? We cannot do the will of God and accomplish what is required of us without it. We will make no mistakes if we pursue that course. That spirit is with the Apostles, and with the Elders of Israel who are true and faithful. The rising generation should labor to obtain the Spirit of God. Get it within you and it will be a continual monitor with you. That is one reason brethren and sisters, why my life has been preserved. I will tell you another reason. Of course, this is my own reason for it. One reason why I am here is because the Lord has chosen the weak things of this world to preach the Gospel, to do His work, to build up His kingdom. I do not think He has ever had a weaker instrument on earth to work through than myself. The Almighty has known that never for a minute since I have been a member of this Church have I had any power to take any honor or glory to myself with regard to anything that I have been enabled to do in the work of the ministry or elsewhere. Why? Because I have known it has come from God, and not from me. And no other man who has engaged in this work has had any power of himself. This Power has come from God unto us, whereby we have been enabled to do the work He has required at our hands. There is a change coming over the earth; there is a change coming over the Christian world; and it is at our door. You read the revelations in the Bible, in the Book of Mormon and in the Doctrine and Covenants appertaining to our day and the [p.32]generation before the coming of the Son of Man. War! Yes; war is one of the troubles that belong to the generation in which we live. It will come to pass, and no power beneath the heavens can stay it. Who cannot open their eyes and see the change in the things around us? Read these revelations—the revelation just read by Brother Cannon, and the others in these books. The God of heaven has set His hand to carry out these great purposes that you read of. They are as sure to come to pass as that God lives. There is no power on earth, nor beneath the earth, nor anywhere else, that can stay the fulfillment of these things. And they are at our doors. I am anxious that the Latter-day Saints shall round up their shoulders and bear off the kingdom of God. Many in the world have labored to try the overthrow Mormonism. They have driven our people from their lands. They have persecuted and afflicted us. They have put some to death, for the word of God and testimony of Jesus. But they have not thwarted the purposes of God in any of these things. The Lord, in His mercy and wisdom, has led this people to these valleys of the mountains. It is ordained of God that Zion is to be established here. Here is the Tabernacle that the Prophet spoke of as a covering from the storm and the wind, etc. These temples are here in fulfillment of prophecy. We have four of them in this State. President Young was honored of God in the establishment of these things. He lived long enough to dedicate the corner stone of this Temple on this block, into which the Latter-day Saints go and deliver their friends who are in the prison house, and attend to the ordinances of the house of God for them, in fulfillment of the ancient Prophets, who spake as they were moved upon by the Holy Ghost, to the effect that saviors should be raised up on Mount Zion in the latter days while the kingdom is the Lord’s. Zion has got to arise. “Sing, O heavens; and be joyful, O earth; and break forth into singing. O mountains; for the Lord hath comforted His people, and will have mercy upon His afflicted. “But Zion said, The Lord hath forsaken me, and my Lord hath forgotten me. “Can a woman forget her suckling child, that she should not have compassion on the son of her womb? Yea, they may forget, yet will I not forget thee. All that has been spoken concerning Zion will come to pass, and you and I today are witnesses of these things. We are here for salvation and eternal life. We are here to obtain those great blessings which Saints of God in every age of the world have obtained when they have obeyed the commandments of God. Shall we fall? No, we shall not if we do our duty. The Gospel is just as good today as it was in the days of the Savior. As to the glorious blessings of the Gospel of Christ, they have been unpopular in almost every age of the world. Take Christ Himself: where was there a more unpopular man than the Savior of the world in His day? And His Apostles were unpopular. They were put to death for the word of God and testimony of Jesus Christ. Nevertheless, Christ was the Son of God; and the Sadducees, the Pharisees, the Essenes, and all the sects that warred against Him were cursed and many of them were cast down to hell, while He remains as the Savior of the world, and received the honor and the glory which His Father had ordained for Him. I want our young people especially to remember these things. Those who are going upon missions must not neglect them. Unless you have the Holy Ghost with you when you go out to preach the Gospel, you cannot do your duty; but when you have that you are safe, go where you will, and your words will have their effect in the hearts of the honest and meek of the earth. Brethren and sisters, I feel to thank God that we are as well off as we are. I feel to thank God that we are in the position we occupy in these valleys of the mountains. Here is a safe place. While in the dedication of that Temple I saw the judgments of God that were about to be poured out upon this [p.33] generation. They will come to pass. I read the other night of a terrible flood. Who ever heard of such a flood in America before? These floods, and troubles and tribulations are increasing in the earth, and they will increase until this scene is wound up. I pray God my Heavenly Father to bless you all, to inspire our hearts, that the vision of our minds may be open to comprehend the position we are in and the responsibility we are under. The eyes of all heaven and earth and hell are over us. The eyes of the devils are over us. They labor for our destruction; but they have not power to do it. We are in the hands of God. He holds the keys of the destinies of the inhabitants of the earth, and He will bless the righteous, no matter who they are nor where they are. I am thankful to listen to the teachings that I have heard at this Conference from the Elders of Israel. I rejoice in the progress that has been made during the past year in the Church abroad. There has been an addition to the Church that we have never met with in any other year since the organization of this Church. And here at home there has been a great addition. Our sisters have labored faithfully in the Primary Associations, in the Mutual Improvement associations, and in every capacity in which they are called to labor. The blessings of God are with them, and they are doing much good. The Sunday schools have also added to their numbers. They have now over one hundred thousand members. The Young Men’s Mutual Improvement Associations, as has been said, have an addition of about thirteen thousand as a result of their labors the past year. God is blessing those who labor among them. If you can save a soul from death, what blessings you will have with that soul. As the Lord said to Oliver Cowdery, “If it so be that you should labor all your days in crying repentance unto this people, and bring, save it be one soul unto me, how great shall be your joy with him in the kingdom of my Father.” We should continue in this labor, that we may gain the salvation of the souls of men. Inasmuch as you will do this, the blessings of God will attend you. Zion has got to arise or fall. Which shall it be? The proclamation of the Gospel of Christ is in favor of Zion. All the revelations appertaining to this day are in favor of Zion, and of preparing the way for the coming of the Son of Man. And Zion will arise and shine. God bless you, one and all. Let us do our duty and seek to magnify our religion, that when we get through we will rejoice in that. It is better to be on the Lord’s side than anywhere else. I want salvation. I want to meet my forefathers and my friends whom I have labored here to redeem, who never heard the Gospel in their day and generation. God has given us this privilege. We have Elders of Israel laboring in all these temples day by day for the salvation of the children of men. We have been blessed in this labor, and we will continue to be blessed; and when we get on the other side of the veil there is not one of us but will rejoice for the good we have done. May God bless you. I feel to bless the Latter-day Saints, as far as I have power to bless. Our daughters and our mothers are laboring for the salvation of Israel in their line, and so are the Elders of Israel in their line. But we want to increase and continue to increase, until we have power in the earth to gather up all the honest and meek of the earth. God bless, guide and direct us all in the path of truth and righteousness, for Jesus’ sake. Amen.